Reward charts with video game characters! Our video game behavior charts will make managing behavior much more fun for your kids! 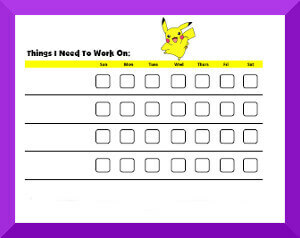 Behavior charts with video game characters can be used as chore charts, star charts, pet care charts or any other way that your child wants to track behavior! Also see our Disney Jr. Behavior Charts, Behavior Charts with Movie/TV Characters, Nick Jr. Behavior Charts and our Step Charts with Popular Characters. And for some tips, read How to Use Behavior Charts. You can use the "comments" space to list rewards earned or comment on how the week went. Drop us a line if you'd like a character that you don't see here.